You see the People main page when you first go into the app. 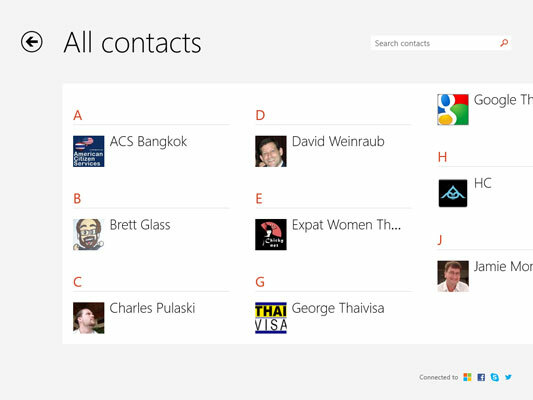 The Metro People screen shows your picture, the most recent notifications waiting for you, mug shots of people in your Favorites list, and an alphabetical index into your All Contacts list. From the main Metro People screen, click or tap the Me link, and you see the Me, Me, It’s All About Me! screen. From the Me screen, it’s easy to post on your Facebook wall: Just type something where the screen says What’s On Your Mind?. The latest Facebook Timeline posts for your account appear in the lower right. Scroll farther to the right, and you see a list of Facebook notifications. Scroll farther and there’s a link to your Facebook pictures — but there’s no way to copy those pictures onto your computer. 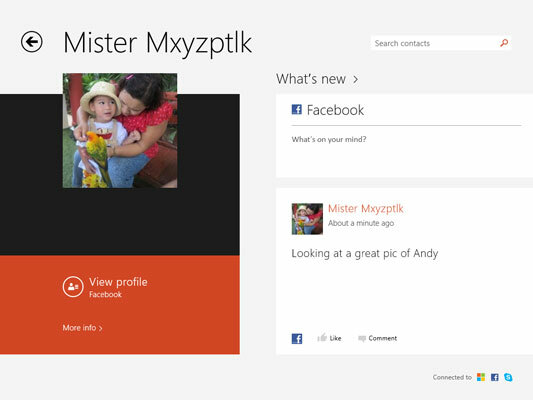 Click or tap on the Me screen’s View Profile, and you hop directly into your Facebook profile. Changing your Facebook profile won’t change anything here on the Me screen. 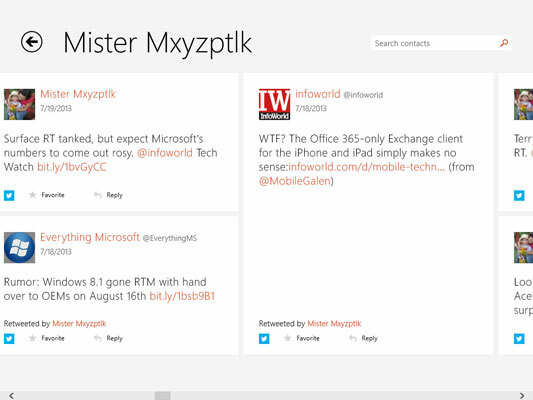 From the Me screen, click or tap on the What’s New link, and you get the What’s New screen. You can get to the same place by clicking or tapping the What’s New link on the main Metro People screen. The What’s New screen shows Facebook status updates and tweets from people connected to those accounts. Swipe from the bottom or top, or right-click the What’s New page, and you can refresh the tweets and status updates. Although Metro People refreshes itself from time to time, if you don’t refresh, the stuff you’re looking at is probably stale. As you may imagine, if you click or tap on the All Contacts link on the main Metro People screen, you get a tiled list of all of your contacts. The list is alphabetized by first name or the first word in a business name. 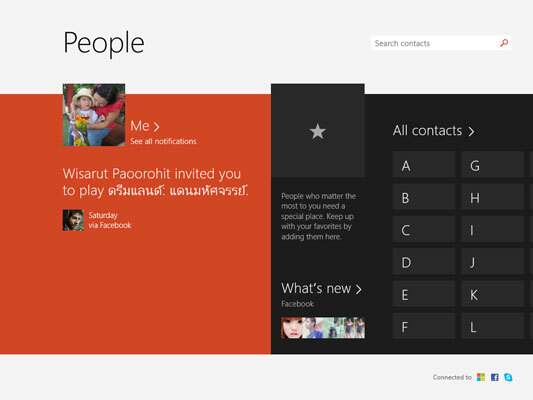 If you click on an individual contact, Metro People brings up a screen similar to the Me screen with a picture, links to profiles on Facebook or Twitter, and the latest posts from the person. If you want to show your All Contacts list sorted by last name, swipe from the right (or hover your mouse in the upper-right corner, or press Windows key+C) to bring up the Charms bar. Choose Settings, and then Options. There you can tell Metro People to sort by last name. You can also tell it to show or hide People from various sources (for example, hide every contact from Facebook).